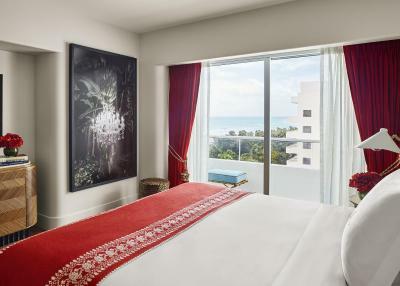 Lock in a great price for Faena Hotel Miami Beach – rated 8.6 by recent guests! 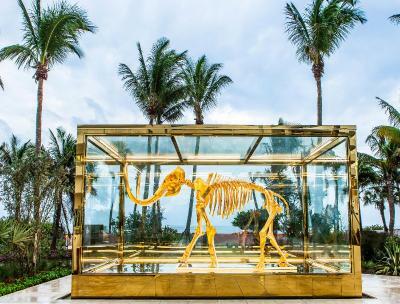 Staying at the Faena Miami Beach is like living in an Alice-in-Wonderland-esque dream world, where design and art are the defining features of a charming existence that transcends the concept of merely a “hotel”. The decor in the restaurants and bars was immaculate in conception and execution, with the resulting sensation that we were special guests in an alternative reality. We didn’t want to leave and did so with a heavy heart. But we will be back soon! This is a unique hotel. Can’t be easily compare to other 5 stars hotels. From the beginning you can notice that the atmosphere there is different. It is a delight for the senses. The decoration, the restaurants, the amenities, the staff hospitality. This is one of a kind hotel. Rooms are very clean, property is gorgeous. Right on the beach- a great location- and the pool is also clean. Staff was extremely kind and helpful. Breakfast at the hotel is also fantastic. The staff are professional and friendly. The beach and pool are absolutely perfect. Great location. Just a wonderful place to stay! Stay here if want to stay at one of the best in Miami ! Amazing. I will definitely return. We even got an upgrade to the junior suite. 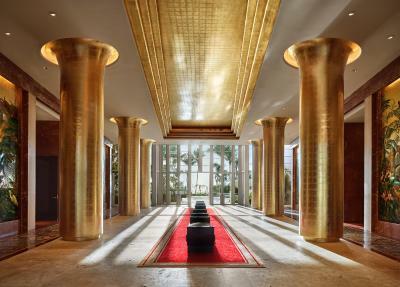 The Faena is by far one of the best hotels in Miami Beach, from the service in the lobby to the service at beach front it's all incredible. Staff friendly and helpful. Food service wonderful and delicious tasting. Especially liked toilet features. Bed comfortable and clean. 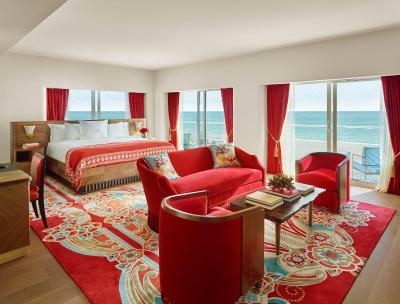 Faena Hotel Miami Beach This rating is a reflection of how the property compares to the industry standard when it comes to price, facilities and services available. It's based on a self-evaluation by the property. Use this rating to help choose your stay! The oceanfront Faena Hotel is situated in Miami Beach, Florida and features an outdoor pool and a South American-inspired spa with massage, nail care, and salon services. The fitness centre with an ocean view offers daily indoor and outdoor classes. A relaxed meal or cocktail can be enjoyed at Veranda, which boasts views of the pool and ocean. Pao serves Asian cuisine with international influences, including original rice dishes and fresh meats and fish. The restaurant, Los Fuegos, boasts an open-fire kitchen and dishes made with local ingredients. Guests can retreat to the late-Deco styled rooms with free WiFi, a flat-screen TV, and a safety deposit box. 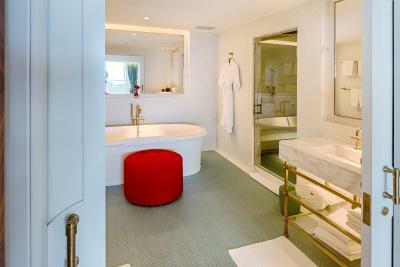 Each Carrara marble-tiled bathroom has bathrobes, slippers, and complimentary toiletries. Nearby, the Miami Beach Convention Center is 1.6 miles away, and golfing is 1.8 miles away at Bayshore Municipal Golf Course. Premium shopping at the Lincoln Road Mall is 8 minutes' drive from the Miami Beach Faena Hotel, while the Art Deco District is 9 minutes' drive away from the hotel. 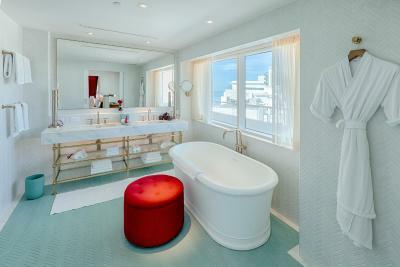 When would you like to stay at Faena Hotel Miami Beach? 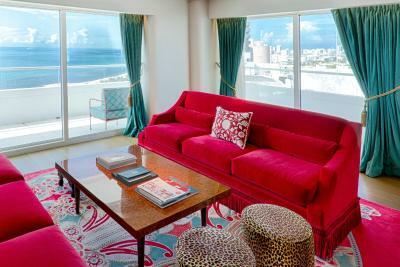 This room features a window seat with views of the Intracoastal Waterway, Biscayne Bay, and Miami city center. A flat-screen TV, safety deposit box, and handcrafted work desk are included. 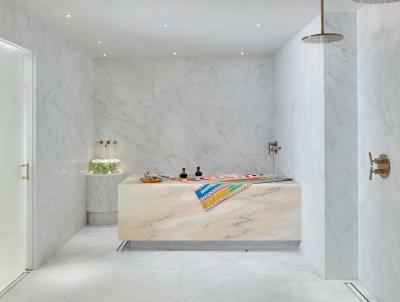 The Carrara marble-tiled bathroom has a walk-in shower and complimentary toiletries. Extra bed (roll-away) not allowed. 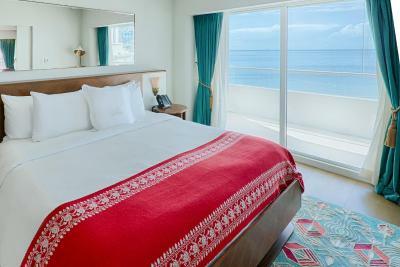 This double room has an oceanfront balcony, satellite TV and iPad. And en suite seating area with a sofa is also provided. 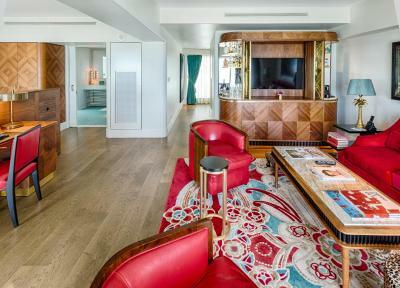 This suite features a balcony, cable TV and a seating area with a sofa. It features an ocean view. 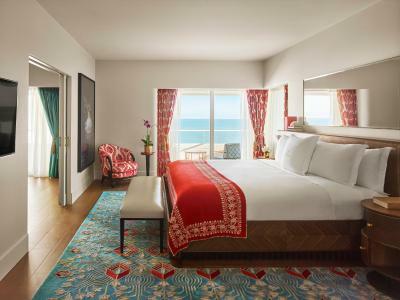 This corner junior suite includes a balcony with oceanfront views. An en suite seating area with a sofa and mini-bar are provided. 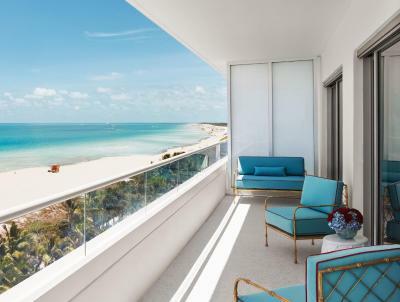 This oceanfront suite offers a balcony with views. The en suite seating area is furnished with a sofa and chairs. 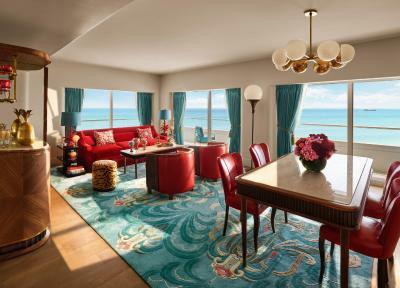 This premier corner suite includes a wraparound balcony with an oceanfront view. The seating area includes a sofa and a dining area with chairs. A soaking tub and walk-in shower are also provided. This suite features a separate living room with a sofa and chairs. Additional amenities include a balcony and a private bathroom. 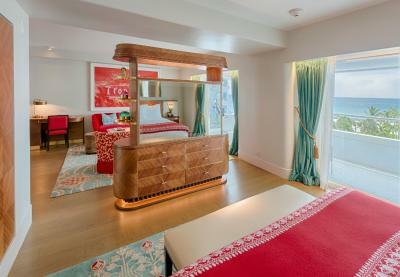 This junior suite has balcony and ocean views. The seating area includes a sofa and chairs. This spacious suite includes a living room with a dining table, sofa and chairs. Two private balconies are provided, as are 1.5 bathrooms. 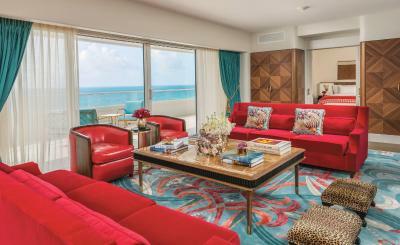 This ocean view suite includes a living room and dining area. A balcony is provided, as are 1.5 bathrooms. This spacious, 2-bedroom suite features 2.5 bathrooms, floor-to-ceiling windows and a living room and dining room area. 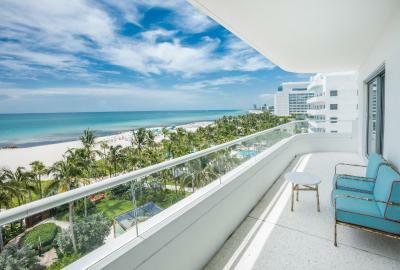 This 2-bedroom, 2.5-bathroom suite features a wraparound balcony with oceanfront views. A living room and dining room are also provided, as is a wet bar. 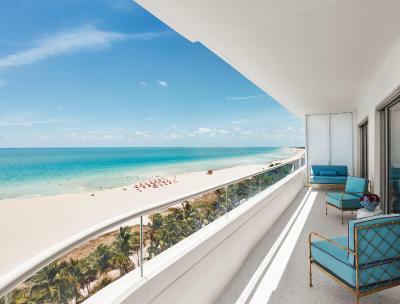 This 2-bedroom, 2.5-bathroom suite includes a balcony and oceanfront views. A living room and dining room area are also features in this spacious accommodations. 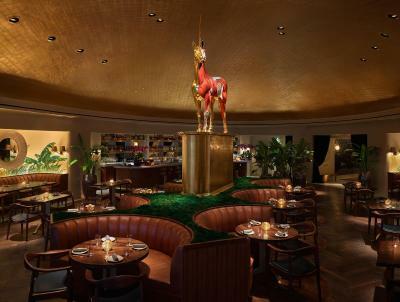 House Rules Faena Hotel Miami Beach takes special requests – add in the next step! 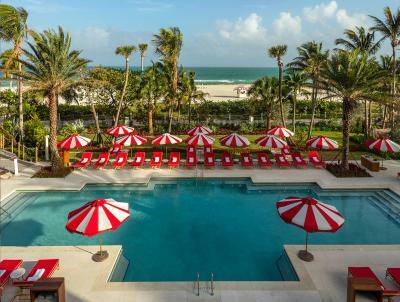 Faena Hotel Miami Beach accepts these cards and reserves the right to temporarily hold an amount prior to arrival. Please note breakfast included rates are for a maximum of 2 guests. Please note that there is a credit card authorization of USD 250 per day. Partial Ocean View Two Queen Junior Suite. Expensive parking, however you can use public one around the corner which is much cheaper. Bars and restaurants are must visit. 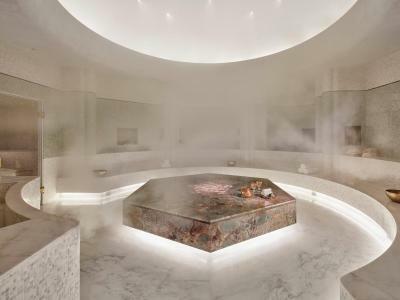 The best SPA i ever tried in US, you can find everything you need, very comfortable. Massage was great, i made deep tissue with Shane. Beach facilities are very good, the food was delicious. Very friendly staff, specially Richard at the hotel entrance. The hotel and room interior is beautiful. Concierge very unhelpful. Restaurant staff snooty and unhelpful. Door man was the nicest! Very gimicky hotel. Didn’t like the corridors to the rooms. Reminded me of being in school. Service was generally good but the pool and beachside service was at times patchy with delays or even some orders being forgotten. Turndown service seemed inconsistent, happened on the first night but not the second. Beautiful property with lots of stunning details. Very expensive but well worth it for a special weekend away. Enjoyed dinner at Pao and the Sunday asado brunch. 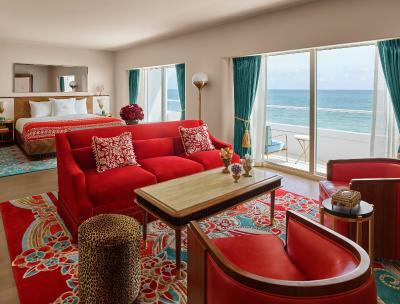 The premium ocean view junior suite was beautiful with amazing views. In room dining was a little expensive for what it was. As a guest I don’t appreciate paying extra for open spa use. Beautiful rooms. Decor is one of a kind and maintained. Spacious rooms, ample storage, huge bathroom. Restaurants were great and loved the art. Staff were gracious and helpful at all times. Would recommend. Stylish decor, pleasant staff, good facilities. The most aggravating element is that you cannot reliably count on access to the restaurants, which were sold out for our entire trip. Not having the ability to dine within the hotel dining rooms was a constant source of annoyance. The hotel needs to ensure there is seating reserved for hotel guests ahead of external bookings. Nothing important. Wouldn’t be fair to highlight anything negative here. As always you can only get better but in this case they deliver an amazing service. Everything was clean and upscale! Would like to see recycling in the rooms- or at least a notice that trash containers are sorted for recycling after they are picked up. 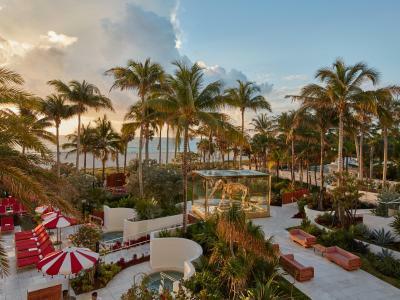 The breakfast policy is unacceptable for a five star hotel which aims for the pole position at Miami Beach. You got $100 free of consumption and afterwards you pay for the “included breakfast” - I travel a lot and see many fancy places but this is a first and definitely a big minus. First day the night service was on the spot - second night nothing was done. Had to call the operator to get our five star experience. Although the place is amazingly curated and comfortable it is not flawless. You would expect nothing but perfection at this class and price level. 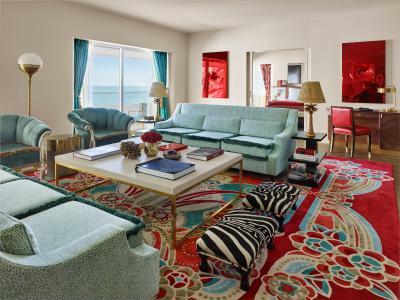 Astonishing interior and nicely curated art and furnishings. Rooms are comfy with good layouts. Pool and beach are nice. Very well equipped gym. Front door crew is attentive and friendly. All together a good place to slow down and relax.